Early Review: ‘Black Panther’ is a masterpiece. Here’s why you need to see it for yourself. …And Black Panther hitting the big screen. Now that we’re 10 days away from the release, I can testify that Black Panther is a masterpiece. No hype. It’s that good. It’s not just because the cast is full of our most Black, most beautiful and most woke actors. Or the movie’s gorgeous futuristic afrocentric costumes. Or even because this is the first Marvel flick with a Black director (Ryan Coolger) and Black superhero (Chadwick Boseman) who are positioned front and center. Black Panther is remarkable because this film is a movement, a revolution in progress, and a joy to experience all wrapped into one. #WhatBlackPantherMeansToMe (and us) is more than a movie. 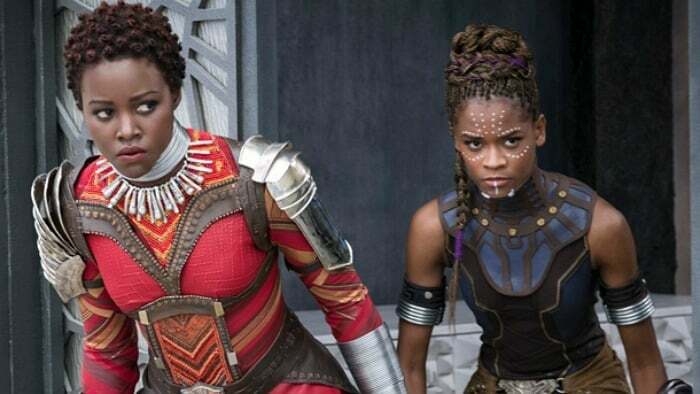 Sure, you’ll get the action-packed chases and fight scenes expected from Marvel storylines—your heart might skip beats watching Black Panther fly across the screen in his shiny latex Black Panther suit, and you’ll be tempted to cheer out loud for Nakia (played by the heartfelt Lupita Nyong’o) as she plots crafty escapades. At the heart of Black Panther’s monumental significance is the film’s cultural relevance, setting it apart from other superhero flicks. Details like the character’s natural hairstyles, the Wakanda dap-handshakes and even Kendrick Lamar’s handpicked hip-hop soundtrack bring everything full circle. Then there is the mythical country of Wakanda itself, which functions as its own character in the movie. It represents the brilliance of African intelligence and technological innovation, in a world which wants to take its resources. A special feeling comes upon you in seeing Black and brown people rule their own land. And you just might come out of the movie saying #WakandaForever. Chadwick Boseman displays a quiet strength as Wakanda’s ruler, T’Challa a.k.a Black Panther. When he’s on screen, you want to root for him and his growth as a leader and hero. Moviegoers may even be surprised to find themselves rooting for the villain, Eric Killmonger— and not just because Michael B. Jordan is finer than a baby tooth comb. Killmonger may go head to head with T’Challa, but his powerful origin story is one of the many reasons you’ll feel emotional about the meaning of his character. And when it comes to its female cast, Black Panther is a movie where black women get to skip being accessories, comedic relief or merely objects of sexual desire. In Wakanda, sisters are smart enough to make technology work and equally gorgeous. They are fully human characters who have agency and fight just as fiercely as the men on screen as members of T’Challa’s all-female bodyguard crew known as the Dora Milaje (a group of characters given more importance thanks to comic writer Ta-Nehisi Coates). Danai Gurira is fierce as Okoye and look out for Letitia Wright who gives a standout performance as T’Challa’s brilliant sister Shuri. Black Panther is movie where the Black community, our families, and our love for each other is front and center. It also showcases the complexities of black experiences in relation to other races. Wakandans aren’t beholden to white colonialists and in fact, they clapback quite confidently in the face of white privilege or entitlement. The film is unapologetic in its blackness without being preachy, stereotypical or corny. Whether you were born in Nigeria or Compton, you can feel black pride. As a kid, I often rooted for the solo Black Power Ranger. When I window-shopped for baby dolls in the ‘American Girl catalog, Addy, the coco brown, Civil War era girl who dreams of freedom, was my favorite. The doll tests conducted by African American psychologists in the 1940s had Black children pick between identical white dolls and Black dolls choosing whichever was more beautiful. Sadly, these impressionable black children usually picked the white doll over the black doll. Today, our kids will have the images of T’Challa, Nakia, Okoye, and Shuri to pick from should they visit a toy store, as representations of Black people who are born free and were never tokens. Black Panther is a master class in what it means to be proud of who you are, where you have been and where you and your people are going. The revolution may not be televised, but it just may get new life on February 16th.